Poland is sending back 1,000 tonnes of illegal waste that was shipped in from the UK, Unearthed has learned. 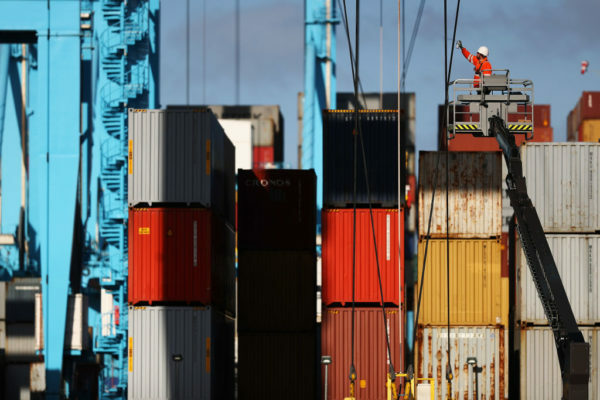 The 45 containers, destined for Polish waste sorting facilities, were marked as plastic recycling but when officials intercepted the exports at a port in Gdynia, they found boxes, tins, detergent packaging and engine oil, according to a report by the Telegraph last week. Now the UK Environment Agency (EA) has told Unearthed that the Polish authorities are making plans with them to repatriate the waste. Meanwhile the EA has launched a criminal investigation into three firms, which cannot be named for legal reasons. Exporting illegal waste is a breach of EU waste shipment regulations. Penalties include fines and imprisonment. EA chief Sir James Bevan warned two years ago that waste crime was becoming “the new narcotics”, costing Britain £1bn a year. The Polish prime minister has announced a crackdown on imports of municipal waste following a spate of toxic fires at waste dumps. Plastics from UK households and supermarkets were discovered at the site of one of the largest fires in the town of Zgierz in July. The EA said it is not investigating the fire. The illegal exports come as the recycling industry faces a global crisis, after China introduced a ban on plastic waste imports at the start of the year. UK plastic waste exports to other countries have subsequently shot up. Exports to Poland increased by 31% in the first four months of 2018, compared to the same period in 2017, according to an analysis of trade data by Unearthed. The Environmental Services Association (ESA), a trade body for the UK waste and recycling industry, warned firms and councils to be “vigilant” on waste exports. Jakob Rindegren, recycling policy adviser for the ESA, which is working with the EA on waste crime, told Unearthed: “if it’s correct as alleged in the press about the involvement of organised criminals then that is very serious indeed and local authorities and businesses need to be vigilant and make sure they understand their duty of care requirements”. The news comes as the industry waits to see if the crisis will be escalated further by an amendment that Norway has submitted to the Basel convention, an international agreement on the shipment of waste materials. The proposal, if approved at a meeting in September, would reclassify plastic waste as “wastes requiring special consideration”, which would prompt further restrictions on the trade. It could mean that the US is no longer able to export to many Asian countries, as it has not ratified the convention. It is not yet clear what the effect on the UK will be, which has ratified the convention. Rindegren told Unearthed it was hard to estimate the impact of the amendment on the UK industry, if approved. He said the ESA is currently working on the assumption that the UK would remain a party to the Basel Convention after Brexit. The EA declined to provide further information or comment as the legal investigation is ongoing. The Polish government has not responded to Unearthed’s requests for comment. This article was amended on 15 August 2018. It previously said that the UK was a signatory to the Basel Convention through the EU. While the EU is party to the convention, the UK has also ratified the Convention in its own right.